As we recall from our history lessons, the Phoenicians were adventurous sea-faring folk who spent their time on and near the waters of the Mediterranean Sea. So it figures that a splendid urban resort named for them is in landlocked Arizona. Small matter. It’s hard to find fault with the Phoenician Scottsdale. 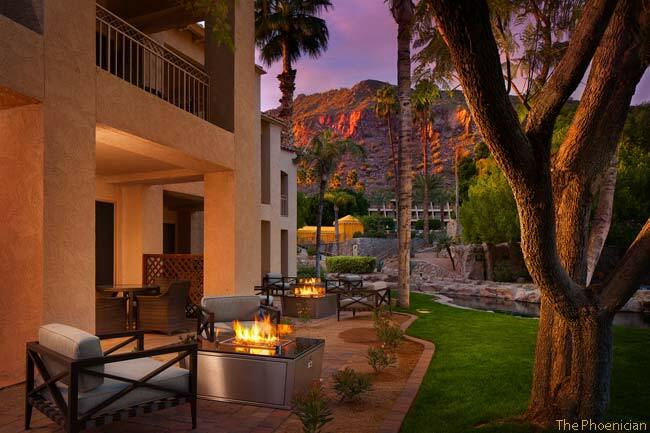 Located at the base of landmark Camelback Mountain, the Phoenician is set in a ruggedly beautiful landscape softened by verdant golf courses, ponds and swimming pools and punctuated with palm trees and tall Saguaro cacti – the green exclamation points of the Sonoran Desert. Overhead is the blue dome of the Southwestern sky. 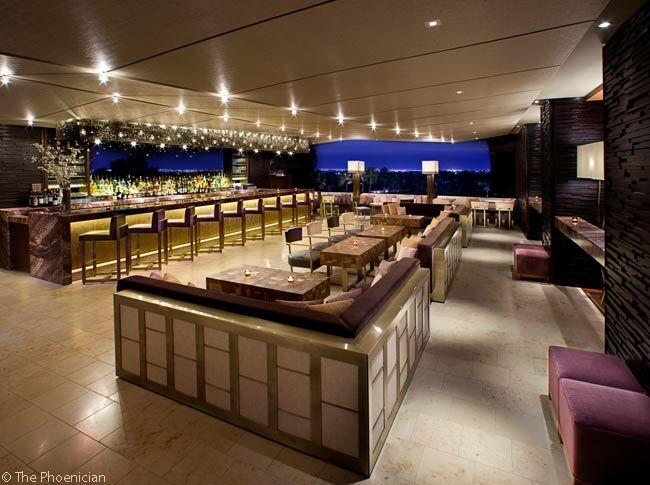 The Phoenician is a 5-star luxury property practically astraddle the Scottsdale-Phoenix city line. The property counts 585 guest rooms and suites. 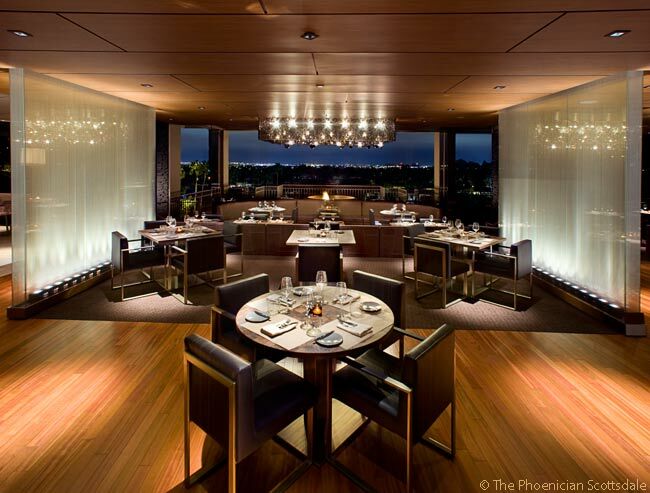 Despite its large scale, the Phoenician’s customer service is personal, friendly and attentive. 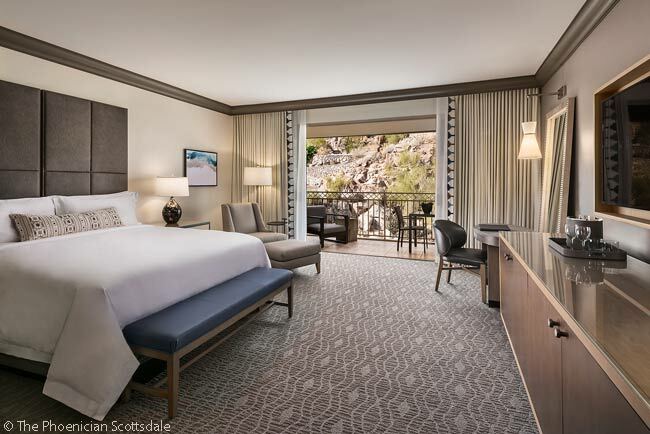 My wife, Georgina, and I spent five satisfying nights at the Phoenician in early 2017. We flew into Phoenix Sky Harbor International Airport, nine miles and about 20 minutes by car from the hotel, set back from bustling Camelback Road just north of downtown Scottsdale. We flew to Phoenix from San Francisco to watch our favorite Major League Baseball team, the San Francisco Giants, play spring training games in the aptly named Cactus League. When we weren’t taking in games at sweet, 12,000-seat Scottsdale Stadium, five miles south of the hotel in Scottsdale’s low-rise, walkable downtown, we explored the city. Scottsdale is to the east of and contiguous with Phoenix, and is home to about 240,000 people. Georgina and I used Starwood points to cover our room. 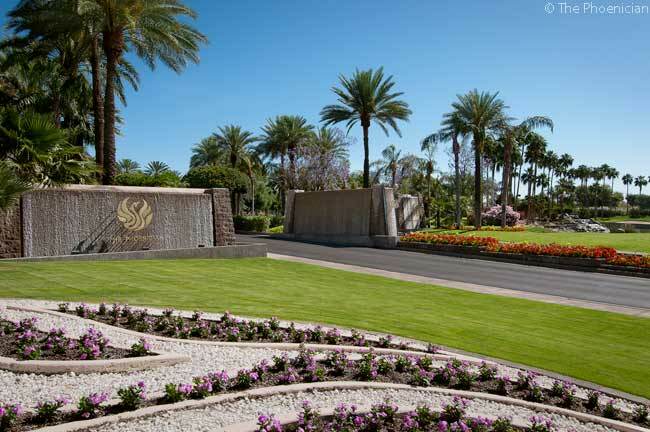 The Phoenician is part of Starwood Hotels and Resorts’ Luxury Collection. Recently purchased by Marriott International, Starwood manages the Phoenician for its owner, Host Hotels & Resorts. Host bought the property for $400 million in 2015, and launched a partly completed refreshment of the 29-year-old hotel, including public rooms, guest rooms, the spa, and several of the resort’s then nine (now seven) restaurants and lounges. At check-in, we were upgraded to a 600-square-foot room on the quiet, mountain-facing side of the property. The Phoenician complex, which includes a cluster of Phoenician Residences and an exclusive, 60-unit boutique hotel within a hotel called Canyon Suites, is nicely situated on 250 beautifully landscaped and well-tended acres. 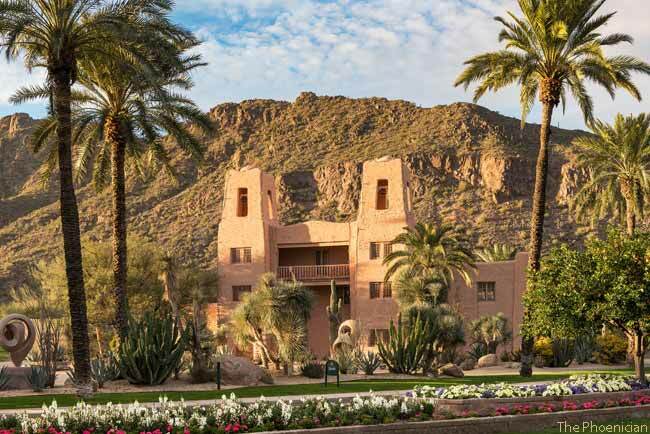 The main hotel consists of two gently curving arcs of terraced, sand-colored seven-story buildings that blend into the rocky landscape and Camelback Mountain just behind. 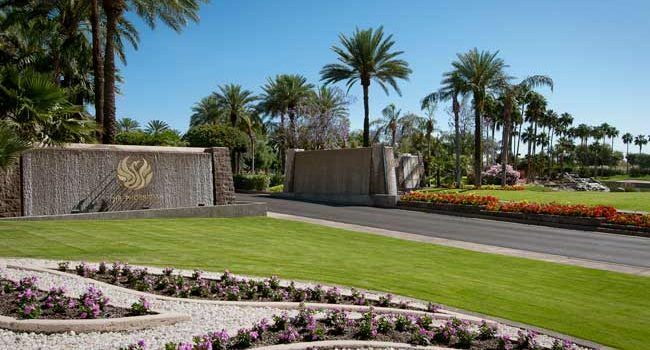 The Phoenician is a popular corporate incentive-travel destination. Hence, it frequently hosts large company meetings, with their speech-making, break-out sessions, banquets and late-night bar action. All told, the property has 109,000 square-feet of meeting space, including an expansive grand ballroom. By coincidence, our first night at the hotel was Academy Awards night. We sipped wine in our fourth-floor room as hometown girl Emma Stone, who was born in Scottsdale and lived there until she left at age 15 for Los Angeles and the movies, won the Best Actress Oscar for ‘La La Land’. We toasted the luminous young star as we luxuriated in front of our 40-inch flat-screen TV on a rare rainy night. We followed that with a light meal and cocktails in the third-floor Thirsty Camel Lounge, an expansive place just off the lobby (being reconfigured until late September). The Thirsty Camel is fronted by an outdoor terrace with long couches, fire pits and sweeping views of the Valley of the Sun. During our visit, a singer-pianist played and sang gamely over cocktail chatter, making me think of the soulful dreamers in ‘La La Land’, yearning for that big break. The revamped Thirsty Camel will feature a long bar running along the window, with tables and chairs on the indoor side of the space. Our guest room included a private terrace beyond sliding glass doors. In the morning, we got glimpses of tiny, flitting birds; in the afternoon sun, we enjoyed views of the hotel’s dry-garden below. The room had a good-sized bathroom with tub, enclosed shower, W.C. and Italian marble trimmings. The bedsheets were Egyptian cotton. The turndown bedside treats were premium Le Belge chocolates. The hotel is family-friendly, boasting a Funician Kids’ Club activity center. It also has a well-appointed spa, tennis, swimming, plenty of indoor retail shops and golf. In full sybaritic mode, we eschewed hard work-outs, lingering over long, late breakfasts. The Phoenician’s new eateries will include Mowry & Cotton, a casual American spot replacing the restaurant where we had our breakfasts. 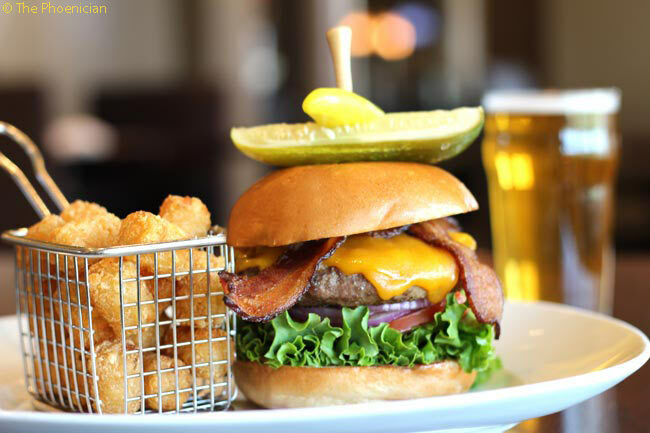 Also on tap is Relish Burger Bistro, an informal burger-centric place; and Kalio Kabobery, a Mediterranean poolside culinary offering, opening in October. We ended our stay with a splurge dinner at J&G Steakhouse. The initials stand for Jean-Georges Vongerichten, the celebrity chef. J&G, located on the top floor, features both an outdoor terrace and indoor tables and banquettes. Georgina savored toothsome salmon with braised mushrooms while I ordered a veal porterhouse steak cooked to order. After dinner, we took glasses of wine outside on the terrace and took-in sparkling-diamond nighttime views of the valley below. Note: The final phase of the Phoenician’s extensive indoor renovation is set to finish by the end of December 2017, when The Centre of Well-Being and the Fitness Center re-open. Elsewhere on-property, the Athletic Club will re-open in March 2018. Work on the aforementioned golf course re-do will run from January to November 2018. 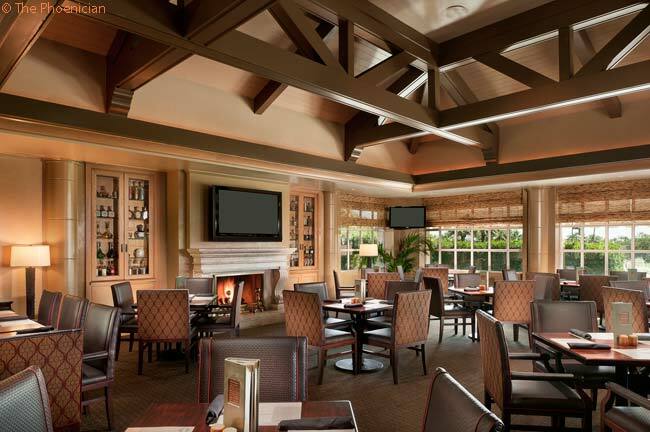 The Phoenician Scottsdale is located at 6000 E. Camelback Rd., Scottsdale, AZ 85251. To book a room, call 1.480.941.8200 (you can also book by calling the toll-free number 1.800.888.8234) or go to www.thephoenician.com. Room rates start at $522 per night, less with special offers and in summer.